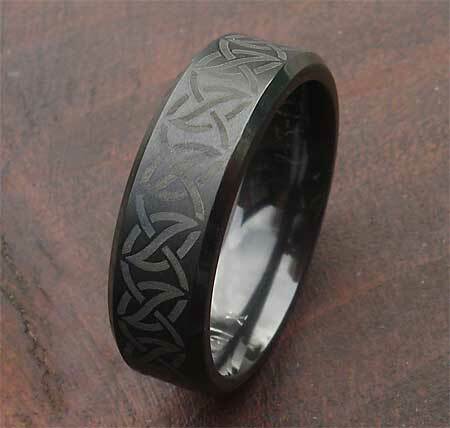 Black Celtic Ring For Men : LOVE2HAVE in the UK! 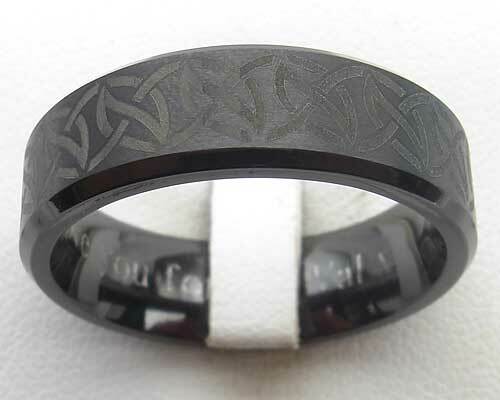 A flat profile, black Celtic ring for men with chamfered edges featuring a bold Celtic knot outer engraving for men from our laser collection. The pattern is very contemporary in design and repeats around the exterior of the ring. A simple, but very stylish modern take on traditional Celtic designs. It measures 7mm in width and comes in a matt finish. The designer tells us that other widths are available also so, please contact us for further details. This ring was tough to photograph, and the images don't do the design justice. The wavy patterning is more akin to a subtle two-tone sandy textured effect rather than a deep engraving. It is a dark shade of grey and contrasts subtly with the black of the ring itself.